Comparison: Standard Polyester retains color through multiple washes and has more tensile strength. Rayon has slightly more sheen, but does not retain color vibrancy as well in the washing. Polyester is best used on any garment, and is the best all around choice. Hint: Use Rayon on items which do not get washed. I really like ordering from AllBrands. It is always a pleasure getting the products so fast and with no issues. Very pleased with the order of thread. I did need to talk to customer service and was treated with friendly competent service. I couldn't have asked for anything more. Thanks for a positive experience. I will definitely continue to purchase supplies from you. Whenever I order from you I am always very pleased. Thank you. I only just purchased my embroidery machine and this was my first order for thread. 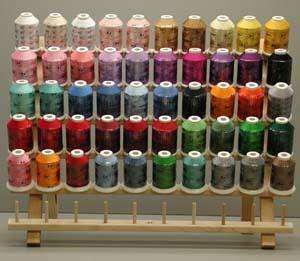 I was delighted that it came so quickly and am very pleased with the selection of colors and quality of the thread. Thank you. My order was just as I had expected and I also want to say when I visit the Lake Charles LA store it was a pleasure. I am new at machine embroidery and they were great at helping me. I am visiting the store again this afternoon. Thank you...just what I wanted for a Christmas gift. My friend loves this thread. Very happy with the products. Thanks! I have had nothing but good experiences with Allbrands. Wonderful product! Very fast service! Excellent price! I was very pleased with your service. This was the first time I have ever ordered any products from you. The threads were just beautiful and I will definately order from you again. I had a great experience and would order from ALLBRANDS.com again in the future. Thanks! I received my shipment of Robison-Anton thread in perfect condition and am very happy with the price and of course, the free shipping with the order. Thank you so much and I'll certainly be purchasing from you again! I'm extremely happy with ALL the products I've ordered but especially with those extra little "freebies" included with some items. I LOVE the PED Basic Embroidery card writer! And...of course, my new White W2900D serger (which you neglected to mention on this feedback form). The customer service reps are all very patient, well-mannered, and SWEET! I plan to be your customer for life. Thank you so much for great service!!! Have a Happy New Year!